The CheckMate arrives with the flashlight and accessories packaged neatly inside a foam lined box. In addition to the flashlight, the box also contains a spare set of O-rings, lanyard, extra switch boot, and nylon belt holster. The origin of the rook series name is evident in the design of the CheckMate with its squared off bezel and crenelations at both the head and tail. Aside from looking like the familiar Chess piece, the design makes it virtually impossible for the CheckMate to roll away when laying on its side. 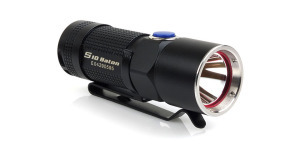 The flashlight is constructed of 6061 T6 aluminum with a matte black hard-anodized finish. Knurling on the body and the slightly enlarged tailcap help provide a solid but comfortable grip on the light in both underhand and overhand holds. Activation of the light is handled by a click-type switch which provides momentary operation with a partial press and constant-on operation with a full press, and audible click, of the switch. The CheckMate has mode memory and will return to the last output level used. Modes are advanced in sequence – High, Low, Strobe – by turning the light off and back on again within one second. Four crenelations are spaced evenly around the perimeter of the tailcap allowing the CheckMate to tailstand and reducing the possibility of accidental activation. The extra width of the tailcap leaves plenty of space between the crenelations and switch, allowing easy thumb access. Each crenelation also provides a lanyard attachment point. The CheckMate fits snugly in the included nylon holster. A Velcro closure on the front ensures the light stays in place and a fixed loop on the back facilitates attachment to a belt or strap. The wider tailcap can make it difficult to insert the light into the holster, at least initially, but it becomes easier after repeated use. Removing the head or tailcap provides access to the battery compartment which can hold a pair of 123A lithium primary batteries or a single 18650 lithium-ion rechargeable battery up to 18.8 mm diameter. The batteries are supported by springs at both ends. The tailcap switch can be “locked out,” to prevent accidental activation, by loosening the tailcap a fraction of a turn. The tailcap threads are anodized and O-ring seals at the head and tail are used to achieve an IPX7 waterproof rating. 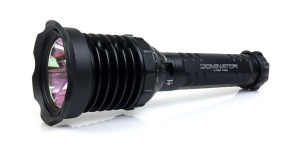 The CheckMate uses a smooth reflector to focus the output from the Cree XM-L emitter into a broad beam with good reach and fairly intense spill. As typical for most reflector based lights, the beam cuts off abruptly at the edges producing a “cone of light” effect. The center hotspot of the beam is very white with a bit of green in the surrounding corona. The spill beam has a noticeably cool tint. The following slides compare the beam of the Rook CheckMate to several other lights to provide perspective regarding its intensity, tint, and distribution. The beamshot photos may be compared across the full width of the image using the slider and additional comparisons may be viewed using the navigation buttons in the bottom-right corner. Runtime tests were conducted using Battery Station 123A primary batteries and an AW 18650 (3400mAh) lithium-ion rechargeable battery. When powered by two 123A primary batteries, the CheckMate provided approximately 30 minutes of regulated runtime followed by an additional 45 minutes of operation before output dropped to 10%. The lithium-ion rechargeable battery provided less regulated runtime but sustained its output for much longer, running for more than 2 hours before reaching 10%. The CheckMate becomes warm during continuous operation, with the head reaching 132° Fahrenheit during the test. 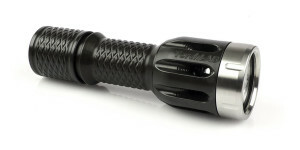 The FoxFury Rook CheckMate is an overall good looking and well constructed flashlight. The exterior hard-anodized finish is very evenly applied and has a nice matte appearance and texture. The laser engraving is very clean, sharp, and legible. All parts fit together as they should and I have experienced no reliability issues with the light. Output and runtime performance are on par with similar sized flashlights that still use the Cree XM-L emitter. The ability to utilize high capacity 18650 lithium-ion rechargeable batteries will be an advantage for some users although the larger battery compartment does allow the smaller diameter 123A primary batteries to move around a bit. Even though the batteries can be heard rattling when the light is shaken, the springs at the head and tail effectively maintain electrical contact. I wasn’t sure what to expect from the squared-off form of the Rook CheckMate but, as it turns out, it’s a pretty practical design. The slight increase in size, when compared to a traditional round bezel, was a non-issue and I like the anti-roll capability it provides. The crenelations on the bezel are surprisingly aggressive and definitely make the CheckMate more suitable for holster carry rather than in a pocket. At the end of the day, the FoxFury Rook CheckMate is an effective, well built flashlight with respectable performance in a very competitive market. The Rook Checkmate has a 24 month warranty against defects in material and workmanship. Additional information can be found on the FoxFury website. FoxFury is a family owned US company based in Oceanside, California that focuses on professional application-specific portable LED lighting. In addition to conventional flashlights, their product line also includes head/helmet lights, weapon lights, spot lights, and some really slick scene lights (area lighting). All of their products are designed in the USA and manufactured with USA and foreign parts in either their controlled plant in Asia or in the USA. The 123A lithium primary batteries used in this review were provided by Battery Station. 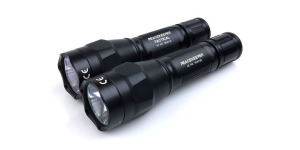 FlashlightGuide.com is an Amazon affiliate site and stands to earn a small commission on purchases made after using any of the Amazon links on this site. These commissions help support the site at no additional cost to the customer and apply to any purchases, not just for the linked items. 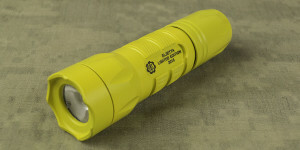 If you would like to support FlashlightGuide.com, be sure to check out the FoxFury CheckMate and the many other products available at Amazon.com.